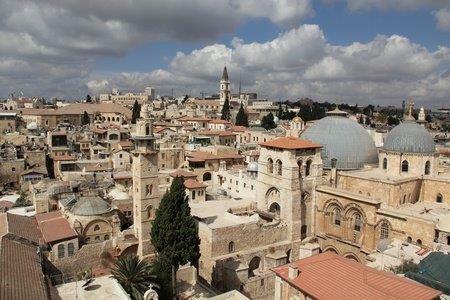 The Old City of Jerusalem is in the East of the city and thus part of the Occupied Territories. There are four historic quarters. The Muslim Quarter in the north-east is the largest in size and population. The Christian Quarter, next door in the north-west, is the second largest, followed by the Jewish Quarter in the south-east and the Armenian in the south-west. There used to be a fifth, the Moroccan Quarter, but that was absorbed into the Jewish Quarter in 1967 following the Six Day War and its buildings largely demolished to improve access to the Western Wall of the now ruined Second Jewish Temple (the “Wailing Wall”). The Church of the Holy Sepulchre is on the reputed site where Jesus’s body was laid to rest after his crucifixion, and thus also the site of his resurrection. It’s the headquarters of the Greek Orthodox Patriarch of Jerusalem, but several other Christian sects own parts of it, including the Roman Catholics and several Eastern Churches (but no Protestants). This entry was posted	on Thursday 30 March 2017 at 05:53	and is filed under 2017, Israel & Occupied Territories. You can follow any responses to this entry through the RSS 2.0 feed. You can leave a response, or trackback from your own site.